I got a new musical instrument last week. It’s like a couple of musical instruments I already have, but it’s SO SO different. My new baby is the center instrument — a Kala Makala concert ukulele. “Concert” is a size — the next size up from soprano, which is the smallest of the ukes. The right-hand ukulele is a soprano, my old cheap Johnson (my, that sounds a little dirty). I felt ready to move up to something that sounds better and is a little higher quality. Mind you, this concert is pretty cheap still. The Johnson soprano was around $25, this Kala concert is $50. Although I got a package deal, which included the ukulele, a really nice padded bag, and an electric tuner. The tuner alone is worth the package price. I got it locally at George’s Music, a chain with stores in Florida and Pennsylvania. What a weird mix. Anyhoo, they had a much better selection of ukuleles than our local Guitar Center, Sam Ash, and that creepy independent place by the freeway combined. Plus, they had a little one-hour Ukulele 101 class, which I forced Scott to attend. Either he’ll start playing with me, or he’ll get a comic out of it, or both. I’m hoping for both. I also did a little IKEA hacking here. 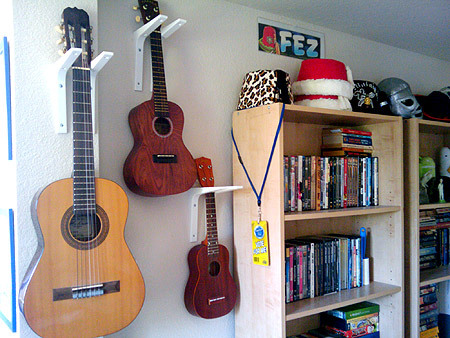 Instead of paying 15 bucks each for guitar and uke wall hangers, I got shelf brackets for 50 cents each. Two for each instrument, and that’s three bucks for my display wall. Works for me! Here you can also admire some of our books and DVDs, as well as the collection of fezzes and Mexican wrestling masks. And my American Idol Experience lanyard. FUN! Also, for the curious, my guitar is a student size, because I have tiny girl hands. Anyhoo, you may wonder how the new uke sounds. It sounds GREAT! You can really tell the difference in quality. Although I wouldn’t scoff at little Johnson; he’s been a great uke, and I’ll still play him. My very first uke (which died years ago when two tuning pegs broke the same week) was a super-cheap yellow floral job, and until it broke, it still sounded OK. I’ve already told Scott that if I had unlimited space and budget, we’d have a massive collection of ukuleles. If you’re interested in learning to play, you could do worse than finding music to play at Dr. Uke, printing out the Ukulele Lady’s chord chart (although I prefer Dr. Uke’s D-chord) and visiting the massive archive at Ultimate Guitar for the chords to your favorite rock/pop songs.